Introducing Infinity 3G. A modular switchboard solution designed for power distribution and metering applications up to 630Amps. The only solution you need for compliance to Australian Standards and Supply Authority Regulations. Simply fill out the customer request form and we will send you all the CAD blocks and menu that will be required to design your Infinity 3G Modular Switchboard. 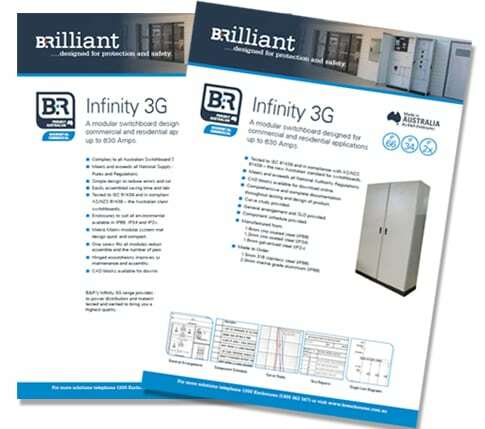 Watch the video to see the testing Infinity 3G has undergone to maintain accreditation to the highest Australian and International standards. Use this form to download the product catalogue for B&R's range on modular switchboards. Additional technical information on our enclosures, drawing updates etc.